Clearview InFocus is a powerful project-based ERP solution built for architects and engineers to run their firms more profitably with greater ease. 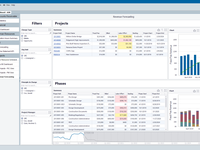 Manage your firm's entire project lifecycle from opportunity to project completion with real-time accounting, billing, and time & expense. 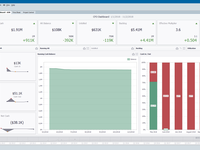 These features combined with InFocus's analytic dashboards, API management layer and cross-database analytics, integrated in real time, set it apart from any other ERP solution in the market. Clearview InFocus Reviews Recently Reviewed! Pros: Its flexibility, power and data retrieval ability. We have forty-five people in our company, with five office locations and six profit centers (disciplines). Of these forty-five people, more than two thirds are field personnel that are often asked to work in various disciplines or support the work in our other offices. At any one time we have a couple hundred projects open for scores of clients. Keeping track of this is incredibly difficult. We worked with Clearview for a couple of months in order to transfer our existing clients, projects, time records and accounting records to our new system. With over 16,000 historical projects and a current work in process in the hundreds of thousands of dollars, we matched to the penny. Working with them is a pleasure. Not only is the InFocus package all that it claims to be, the folks at Clearview are great to work with. Sure there is a bit of a learning curve, but the answers are so intuitive you can't believe you did not think of it yourself. Their support literature, training videos, white papers and support site are extremely helpful. Cons: Getting others in our organization to appreciate and better use this management too. Overall: With hundreds of projects and five offices our managers need to stay current on the status of their work and have the tools to develop new proposals. 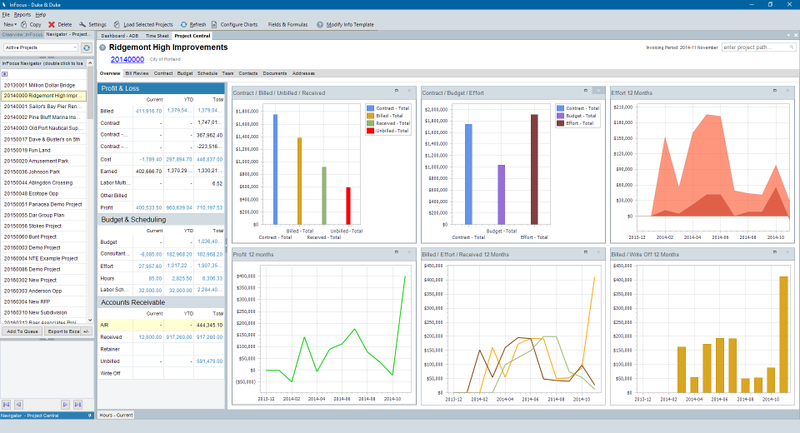 InFocus is indispensable for personnel management and project performance. Plus it provides financial statement and accounting data that is crucial for senior management and independent accountants. The data available and the variety of the reports are limitless. Also, our clients want their invoices and reports in a wide variety of styles. The open structure and adaptability of the InFocus system is a constant marvel at design and intuition. Pros: It's easy to navigate, more intuitive than other products we've used, and customizable. It's difficult to pick my favorite aspect; it's such a great product overall. Cons: I wish user's could change the color of the Sandbox (training environment). Having it the same color as the live version can make it a bit confusing when training others. Overall: Choosing InFocus is one of the best decision we've made. Training can be a challenge when adopting any new system. Clearview offers extensive training videos, consultations, and webinars. Considering most software products continue to improve and implement client-suggested upgrades, I appreciate Clearview's workshops, where users can continue their InFocus education on advanced levels. Having the opportunity to attend has helped me to really hone in on configuring our InFocus database in ways that are compatible with my company's workflow. I also picked up tips and tricks other users developed for their needs. Customer service is also very important to me. I appreciate responsive, knowledgeable technicians and staff members who listen. They do not over promise, over-sell, or mislead when discussing requests, issues or customization. They believe in empowering their users. I LOVE THIS!! They offer a workshop for those wanting to learn advanced report writing. Support staff will work through any issue or request until it has been satisfied. InFocus demonstrates its value. Invoicing is fast. Communicating project details flow more smoothly. Preparing invoices in various formats are easier. All this and more are offered for a low monthly cost per user. They even offer a training version of our data for a very low monthly fee, and any user can access it. This has been crucial when I'm working through project setup options and need to test my ideas. Overall: Being a newer accountant in the engineering industry, I had a bit to learn about how jobs are billed, tracked, etc. It is definitely a different process than accounting for goods being sold! I came into my job as the implementer of InFocus and learned A LOT simply by learning the system. InFocus is so easy to use and straight forward. If there is something that I don't catch onto right away, the Clearview support team is always ready to help and quickly help resolve the issue. As the years have gone on they have updated the system based on feedback from their clients, which is amazing! The changes they have made make things run more smoothly and it is great to know that they are listening to the needs and desires of their clients. InFocus also has a built-in reports, but also its own report builder tool if the report you need isn't automatically there you can create it yourself! Overall, I would definitely recommend InFocus to anyone looking for new engineering software. The program is easy to learn, easy to maneuver in and provides everything you would need. Even your specific need isn't met you can simply reach out to their support staff and be taken care of. It is a great software, but even better customer service - thank you Clearview team! Pros: * No need to keep software on servers on site. Everything is in the cloud. Cons: * Occasional data slow downs which we have no control over because the software is running on Clearview's servers. Pros: Absolutely incredible customer service - a great team of highly skilled professionals providing a quick answer via an open ticket, a walk-thru via Webex or customization via a Work order. Cons: Whenever and whatever we like least in InFocus, we bring it up to the support team and try to change it to the way it would work out for us or find the best solution for it. In most cases it is all repairable and we get the changes we want to use InFocus more efficiently. InFocus team is open for ideas and suggestions and many improvements we asked for have been already in place and we use them routinely now. Overall: Overall, flexible software accommodating engineering firms and great support team to work with. Pros: * Reasonable setup and ongoing price per seat. Monthly billing available. * Quick and easy setup. We were online within 24 hours and had our data converted from Deltek within 7 business days. * Great technical support via dedicated user login message board interface. Answers/response are usually taken care of in under 2 hours for non-critical/emergency issues. 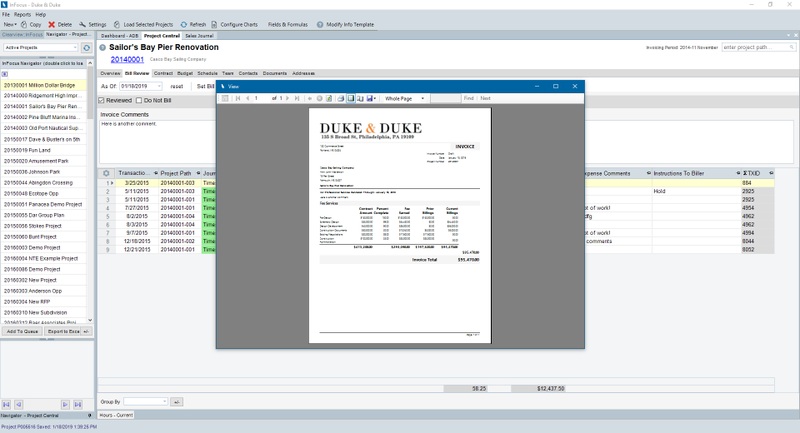 * InFocus Custom Reports and Invoice Designs can be created and edited using the SQL Business Intelligence Development Studio 2005 from Microsoft. Cons: The only real downside so far has been speed of the interface. We had this as an onsite server and response times were awesome with our own dedicated server. I would have hoped that with SaaS that the background horsepower for their servers would be a little better than what it is. Requests take approximately 4x as long to process as when we tested it as a local SQL installation. Please keep in mind that this is a "feels like" statement and not a technically measured out in milliseconds statement. Comments: One benefit I have realized is the ability to make minor edits to Accounting entries without having to go back redo something. The flexibility of this software is unmatched. Pros: One thing I like most about Infocus are the Gridgits on the dashboard that provide various information all in one place. I also prefer this program because of the flexibility in entering data so there is no more deleting something because you have to make a minor change. Infocus has a variety of reports that are easy to understand that provide a wide array of data. I also appreciate check processing in Infocus for Accounts Payable and Employee Reimbursables because it is very easy to use especially with the recent transaction tab. Timesheets are very easy to enter and approve in Infocus and benefits hours are easy to see for each employee. Cons: One thing I like least is that some functionality of Infocus is not user-friendly (i.e. having to use F4 instead of Enter). I also would like to see benefit accrual more automated and payroll integration with outside software (i.e. Pensoft) made more seamless for companies that have salary plus employees. Pros: The analytics help me to keep track of multiple data points without spending tons of time reviewing data. 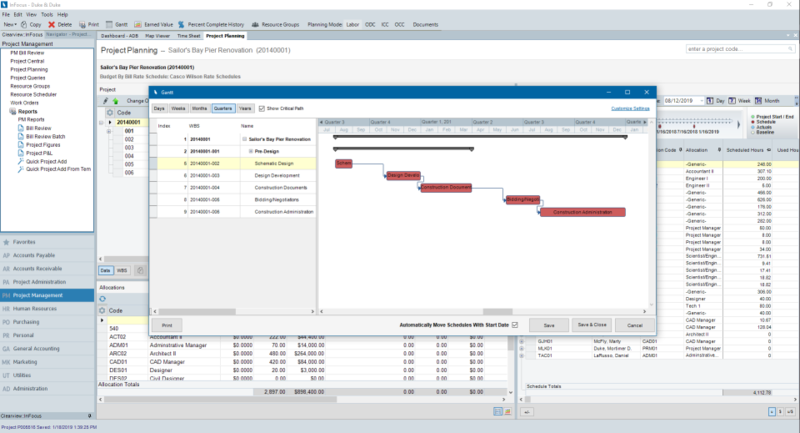 With a few clicks of my mouse I am able to see resource utilization in any timeframe I need, department and associate availability at a glance, projects that have budget concerns, I can see how well we are spending against our plans and easily track opportunities/proposal status at a glance. It's help make my job easier. Cons: We use Project Planning and Resource Scheduler frequently and it works fine but I would like to see more effort go into improving the functionality of its components i.e. Earned Value, Change Order tracking and just having better tools to manipulate the scheduled data. Overall: It's been great experience! We have been working with the Clearview team since 2012, the staff is not only professional in their approach to develop and improve the software but they genuinely care about their clients. We feel that we have had the opportunity to develop a partnering relationship with Clearview's management and staff. This relationship, and using the InFocus tools effectively have allowed us to do a more efficient job at managing our current operations and planning for the future. Pros: I like that the software is able to integrate all aspects of our business, from timesheets to expense reports, invoicing, and bill payment, etc. It is a one stop shop kind of software. Cons: The hardest part of the software is getting it to generate the reports you want if they are not already built into the system, if you want a custom report do you do need to know some sequel background to run a report. I have also found that it is an extremely powerful tool but I am only scrapping the surface, and if I knew more information it could be even more useful. Adding custom boxes to applets to make it more specific to our business. Overall: I am extremely happy with Clearview Infocus. They have been amazing in their customer service department and help when I need it with trouble shooting. They have gotten better about adding tutorials and training modules, and even adding in person workshops to help expand my knowledge and learn more about the software. They are always listening to their customers and adding updates to include features their clients want to see. Pros: I like the ease of transition from one software to another. It is a very easy software to learn and use. I have been using since 2010, and it has progressively gotten better and better. New features are always coming on board. Trust met...you will like it! Cons: Reports are good but I required a great deal of customization to get the results needed. The one downside is that it does not have a payroll application. 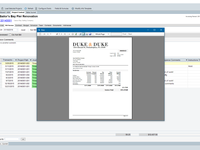 If you do in-house payroll, you will need a separate software to run along side InFocus. Overall: We are a small architectural firm and opted to change to Clearview InFocus when the program we were using was getting too complicated and too expensive. InFocus met our needs in all our required billing, project tracking, etc., but for a smaller investment. I would highly recommend this product to anyone who wants a workhorse software. I can't say enough about it. Pros: It has all the blows a whistles SAP has to offer. For me, it was very important that InFocus had strong internal controls in order to preserve the integrity of the data. Additionally, it is very user friendly and allows for quick queries, custom reports, and third-party integration. It is a software that caters to your needs without the big software restrictions. Cons: Currently there is nothing a true dislike. But if i had to pick one it would be statements. In order to generate stand alone statements and submit to the client it has to be done manually versus a mass email distribution. Similar to invoicing. However, if the client is invoiced on a monthly basis they would recieve a copy of their statement with their invoices. Comments: We've been using this for a few years now and we're still learning how to use it effectively. Overall, I think its a great tool. Pros: Once you get used to the layout its very easy to navigate and find the information you're looking for. I'm sure it can do a lot more that what we're using it for and I'm excited to see how we can grow with it. Cons: It forces you to structure your projects specifically in order to use all of its features. At times it seems too rigid in its assumptions on how a project should be structured and we have to find work arounds. For example we might have 2 Project Managers on one project, but you can only select one per project. Pros: This product has many bells and whistles. The integration between the opportunity (marketing) through proposal to accounting is pretty good. Cons: This product is on the complicated side & not exactly user friendly. You also have to pay for training with them. There are some unique features to this program that if you don't know them, you can get lost or frustrated. There is not a good user's manual but there are some tutorials for various modules that are pretty good and customer service does get back to you in a timely manner for questions. Great for small engineering firms! Pros: This software is easy to use and the support team is great for every question and issue you have. The daily financials and banking systems are easy to follow, and the way employee timesheets, bill reviews and invoicing systems are integrated make billing a breeze. Cons: Custom reports can be tricky, but the support staff is very knowledgeable and will help you out. Overall: Overall we are very happy with Clearview. The attention to detail in each applet makes for a thorough accounting and project management system that can't be beat. Comments: As a mid-sized architectural design firm, we have found Clearview InFocus to be the best integrated accounting and project management software on the market. We migrated to InFocus in May 2010 after using two previous industry specific applications, which never performed as promised. The transition to InFocus was well managed and painless. InFocus is highly flexible and easy to learn and use. It is especially forgiving of input errors, with mistakes easily reversed or voided. As designers of large and highly complex institutional projects, we have sophisticated client invoicing needs. InFocus offers every conceivable billing scenario and allows for multiple billing types on the same project. Likewise, the project management modules are flexible, user friendly, and cover all facets of project documentation. The default and custom reports are extensive and easily changed and manipulated. 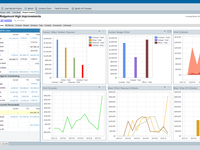 It is easy to pull data out of InFocus in a myriad of formats and easy to customize reports. Clearview's client support is also great - easily accessible with a highly responsive support team. They provide excellent software support as well as accounting solutions. The integration between the project management and accounting functions is seamless. InFocus has allowed us to streamline our finance and project management functions and provided real savings in accounting consultant and in-house staff costs. InFocus is the best performing software I have ever had the pleasure to purchase. It exceeds expectations and has more than met every promise of the developer. This is top-notch software with top-notch support. Any size firm in the design industry would be well advised to adopt InFocus for their accounting and project management software. Comments: It is a little slow to get started, but the control and functions are well worth the time investment. Cons: It does not include payroll; however, I usually prefer to have payroll separate anyways, as the functionality of payroll from a dedicated software is usually much better. 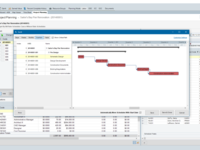 Overall: We have greatly enhanced and automated the project cost management using InFocus. Pros: First of all, I am not an accountant, but DBA/Software Developer. 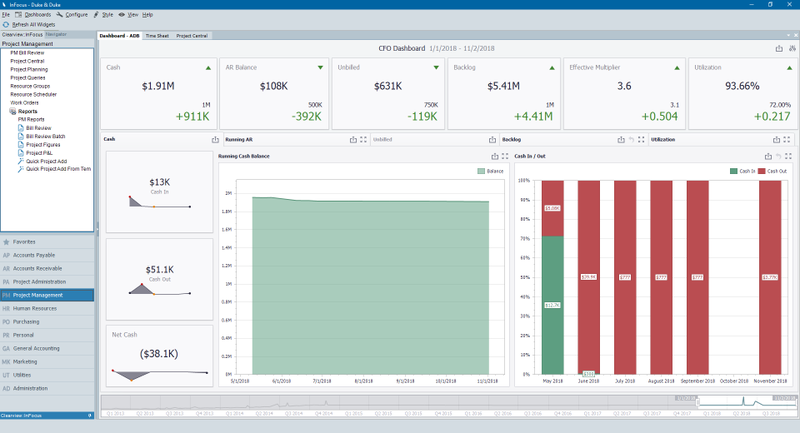 The ability to create customized reports, actions, and dashboards (both traditional and analytical) and incorporate them seamlessly into Infocus really makes this product stand out from it's competitors. Cons: There are a few consistency issues between the applets that are annoying at times. Cons: Tedious to setup multi-company - have to understand the relationships (i.e. Parent - Child - Sister) before you begin to setup. Great Software. We don't use all of the functions, but the ones that we do use are great. Pros: I loved that we were able to transfer roughly 18 years of data over to this software. That was one of the main reasons we switched to this software. Cons: There are a lot of functions that we do not use in the software, but I understand how important they would be for larger firms. It would be nice to have a scaled down version of this software for smaller firms. Pros: For a small firm like ours, InFocus is very affordable, yet has all the functionality that we can function like a medium to large firm from a financial perspective. We can also meet all of the government FAR regulations. Cons: The only con is that there are so many features, it sometimes takes me time to remember what they all do. Very Easy to use compared to other time sheet systems. Cons: Sometimes information is lost if more than one person accesses the time sheet. Also the ability to have more than one time sheet open at the same time and different information showing up on each. Cons: User interface is not user friendly. Meaning there are too many steps to accomplish one thing. 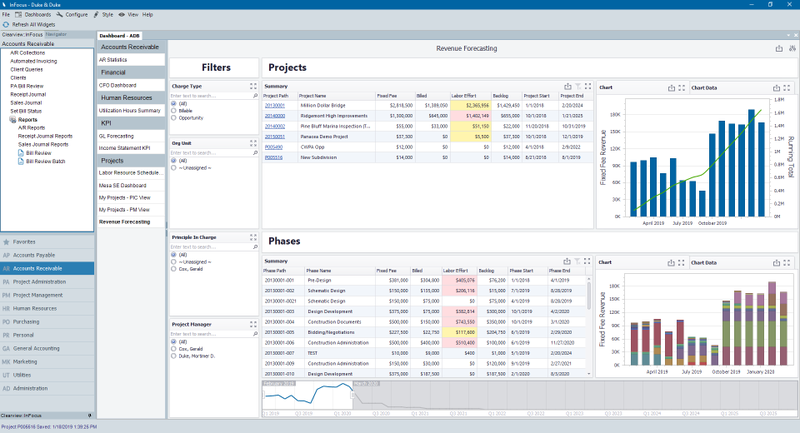 Overall: We use clear view to manage our projects with respect to time and budget. Clear view has made it easier to track our projects with the dashboard as a project manager. Pros: Brock came out and did a great job meeting with us and helping to build customized tools for our team to best utilize the software. Cons: we've paid for so many self-hosted licenses, that it makes it really tough to convert to a cloud based platform and just basically throw away all those initial costs. Pros: Ease of use and the support of the product is great. The reports are wel formatted and laid out. You can extract information easily, according to your needs. Cons: I would like to see the training modules offered free of charge. The monthly maintenance is increasing and in US dollars. InFocus has been the glue that holds our organizational pieces in place. Pros: InFocus provides such an intuitive user interface and provides incredible flexibility. Cons: There is a slight learning curve for folks who are not accounting savvy. Overall: We know have command of our numbers. It's fantastic to see our organization by the numbers in real time and be able to make financial and project decisions. Pros: The greatest pro for this product is just how user friendly InFocus is. Very clean interface. Minimal training needed. Cons: The only really con is not enough people are using it. Other than that I don't really have any complaint from my perspective. Cons: -moving from project administration to project management and back when setting up budgets. Overall: Clearview Infocus is the best accounting and project management software I have used so far. There is no waiting time, data is real time. Pros: Online, web based in the cloud. Dashboard is pretty easy to use, very visual. Need a better way to customize dashboard. Cons: Need mac version. Need a better way to customize dashboard. Would like to be able to send help tickets direct from software. Pros: Fairly easy for end users to navigate and accomplish what is needed, once accimated. Straightforward back end management. Cons: Bit of a learning curve to get going. After that it feels more intuitive. Pros: The software has the ability to capture an unlimited amount of data and translate that into what seems to be and infinite number of custom reports for analysis. Cons: The software platform is dated and does not appeal to the progressive user. Functionality is excellent if all data points and selections are properly input. Many erroneous mistakes are unidentified until you reach a failed attempt to export a related function. Overall: Capturing employee time sheets, project costing, invoicing, etc. Pros: Our company has been with Clearview since 2008 and we've grown with them over the years. What I believe I like best about Clearview is that besides it being fairly easy to use, someone is always available to reach for help via phone or email (during business hours) and they are prompt in responding back. Whether I need a custom report made quickly or training on a new release item they've just put out, it is comforting to know that I'm always going to be taken care of quickly. Cons: I'm really happy with Clearview so really don't have anything specific that I don't like. Recommendations to other buyers: Clearview is a great product and has come a long way over the years. If you are interested in purchasing new accounting software for your company, I would suggest comparing Clearview against a couple other similar products out there. Write down exactly what it is you are looking for and what your budget is, as well as what you don't need or want to see with a new program. Converting over from old software to something new is very challenging and isn't something that is done quickly. I think that accounting software is so important and that it should be considered an investment in your company's future. Pros: Been using it for 10 years. The company has grown a lot in that time adding new features. Cons: It is sometimes a little rigid in the use cases that it supports. Pros: Metrics and planning - Ability to check in on projects in real time. Cons: The UX is clunky. I wish it was easier and more intuitive. There's a lot of glitches - like adding staff to resource scheduler means that the staff cost is not calculated in project planning. Overall: staffing projections are better in our office. Pros: The thing that I like the most about software is its ability to provide me with up to date information that is critical factor in making project related decisions. Also I have found ability to run numerous standard and custom reports helpful. Cons: All of the capabilities are overwhelming in the beginning. Overall: We are solving a lot of redundancy issues that we had with previous software. It is helping us streamline our accounting system. InFocus - a Great Product! Pros: This software offered easy conversion from our former software; they were able to bring all of our previous file information forward for project reference. It matched up with our former software in many ways and is easy to learn and use. Clearview Software's staff is very good to work with during the conversion. The training offered is very helpful, and they will always respond quickly and efficiently to any need you may have. Give them both a try; you will like them. Cons: The only downside I have had is not being able to customize the software's reports at my level to the needs. I have had some custom reports and invoices designed to match up with our needs, but it is too costly to have all my report requirements customized. Therefore, sometimes you have to either run three or four reports to gather the information you may require. Recommendations to other buyers: I would recommend that they spend time with the Clearview sales staff explaining the wants and needs, ask for a demonstration, and possibly get recommendations from current users. Overall: Software is extremely powerful and flexible. Clearview Team is fantastic. Best project management/accounting decision we made when we converted to Infocus. Highly recommend. Comments: I have used large ERP system: SAP,Great Plains, just to name a few. The Clearview team has taken their time to develop a great product. The helpdesk is a great team i always get a rely within a couple of hours and the IT is willing to take a few minutes and explain to me how the system works, help me find a resolution to my problem, and at times help me figure out a work around. With all ERPs as a company uses it more and more and develop their database management always wants to see more information or in different formats. SAP is very strike in what you see is what you get with minimum customization. You would need to export raw data and reformat or spend millions in a report builder app and IT support. I love the fact that i have the availability to create my own querries, reports, and see what information is available. Once i know what i want i can request Clearview to create something for me at a reasonable price. No system is perfect but that fact that Clearview is always looking at improving their system and helping their clients maximize the use of the software. Pros: I like that each PM has the means to review and prepare their own invoice. I would like to know more on how to set up a template style that can be imported for each project and then alter from there. Cons: I wish it were easier to move time tickets around. It takes many clicks to get to move a time ticket to where it needs to be when entered in the wrong location. I wish uploading documents was easier and that I did not have to put on my desk top to move. To edit fees you need to be in one place, to add tasks you need to be in another. The program is not intuitive. Pros: The ability for project managers to see the status of their projects. Accounting, Project Management and CRM all in one place. Seems to be pretty straight forward. Pros: Organization is pretty good. Interface is fairly straight forward. Design of programming works well and is easy to follow. Cons: Features of input seems to change at times. Seems to be other characteristics of the software that are unknown to me. Pros: Friendly use, very easy to use and not that much complicated. Pros: Very easy to use, well thought out, and the layout really makes sense. Cons: At times it is slow retrieving data, but this is rare. Overall: I have been very happy with Clearview. Pros: Customer Service is top notch. Very helpful in tweaking the program to my business. Fast response. Cons: Learning curve - just because I still had to do my job while learning a new software. So I had to do everything twice. Not entirely intuitive, but once you get the hang of the software, it's fine to use. Pros: Very easy to do an expense report, and once you get used to the program it's fine to use and you can enter your time quickly. Cons: You have to use internet explorer to use the program, and there are a lot of strange keyboard commands that are not intuitive. If you don't know the quick key commands, there end up being more steps than necessary to log your time. I feel that some items in the program can be more intuitive and easier to use. It gets the job done. Pros: The layout is nice. I like the list format. The overall calculation of time works well. It is nice that you can copy recent items to a new time sheet. Cons: It is not very user friendly. If you don't know the "shortcut" commands, it can be very time consuming to do anything. Scrolling through long drop down menus is annoying. Comments: Top of the line Project Software. The developer has put a lot of thought and spend a great deal of time in looking at the total scope of the program functionality and how it interacts with real life situations. They have every angle and every circumstances covered. Pros: Very forward thinking product that benefits true life occurrences and situations. Cons: None that I have seen yet. And from what I have seen I do not think it will seen anything derogatory. Recommendations to other buyers: Take it for a spin. You will not regret it. Not user friendly. Every day I dread having to use this product for time and invoices. Pros: This program is only beneficial to our bookkeeper. People actually imputing there time find it difficult to use and time consuming. Cons: This software is very difficult to navigate. It is not easy to use or understand. You need to complete multiple steps in order to get the result needed.